Description: This big heavy duty construction truck has a realistic appearance plus fun actions and sounds all rolled into one! 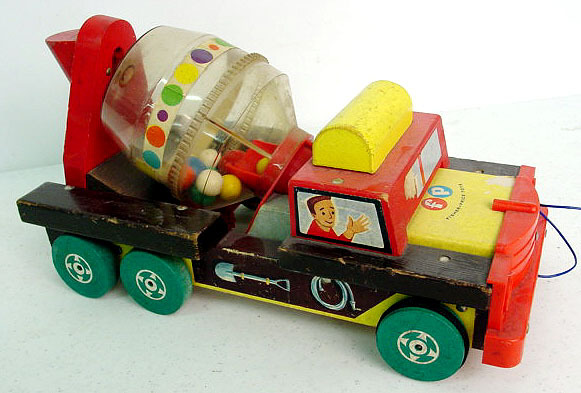 When pulled, the clear plastic mixing drum spins while a plunger fires colorful balls against the sides of the mixing drum creating a "poppity-pop-pop" sound. FPT1667 - Large rectangular wooden truck with yellow and black paper lithographs on the sides and pictures of construction tools. The front of the truck has a red plastic grill, the truck has a red rectangular cab with a paper lithograph picture on one side of a construction worker driver in the window and a paper lithograph picture on the other side of a boy waving in the window. The top of the cab has a yellow wooden rounded top "light". The back of the truck has a clear plastic mixer drum with a thin white paper lithograph around the edge with multi-colored polka-dots. The drum is filled with multi-colored wooden balls. The back of the truck has an upright red wooden back support that holds on end of the mixing drum. The truck rolls on 6 wooden wheels with white heat-stamped hub caps. When pulled, the mixing drum spins and a plunger fires the balls against the sides of the mixing drum creating a "poppity-pop-pop" sound. Measures 13-1/4" long, 6-1/2" high, and 6-1/4" wide. Weighs 3 lbs. Patent Nos. 2,835,074 / 2,833,083 / 2,747,328. Canadian Paent No. 568,338 / 580,946.